They’re putting their money where your open Internet is. 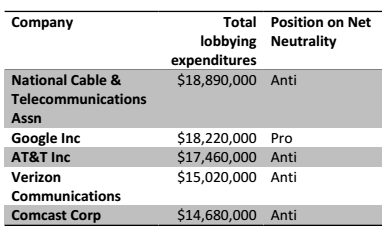 Not only does the anti-net neutrality faction devote more lobbying attention to the issue, but these top organizations also consistently have a much larger lobbying footprint. Figure 2, below, looks at the money that the top pro- and anti-neutrality organizations have spent lobbying since 2003. Consistently, the anti-neutrality groups have outspent the pro-neutrality groups by a margin of more than 5-to-1, although this has narrowed to closer to 3-to-1 in recent years as Google Inc. has increased its lobbying presence. Of the five organizations with vested interests in this issue that spent the most money in 2012 (the last year for which we have complete data), four oppose neutrality. All five, though, spent impressive sums. While the dispute over network neutrality is often thought of as a battle between giant corporations, it’s clear from the data that over the lifespan of this issue, the pressure has been far from equal. The leading opponents of neutrality (largely the Internet service providers) have devoted significantly more resources to lobbying than the leading supporters of net neutrality (largely the big tech companies). While the tech companies have been expanded their lobbying presence recently, they are still playing catch-up. The big telecom companies have spent years convincing key decision-makers. We will see soon whether all their intense lobbying has paid off. Lee Drutman and Zander Furnas are fellows at the Sunlight Foundation, a nonpartisan nonprofit that advocates for open government globally and uses technology to make government more accountable to all. Cisco has an anti-net neutrality statement on its site. Corporate officers at Tekelec have spoken publicly in favor of network management, and against net neutrality, especially in the mobile broadband market, on multiple occasions. The National Music Publishers Association has argued for a non-net neutral approach that will require ISPs to engage in network management to block or throttle traffic that violates copyright. Lobbying activity was aggregated up to the parent company, rather than looking at individual subsidiaries. For example, lobbying activity by Verizon Wireless was counted as activity by Verizon Communication, its parent company. All dollar amounts are shown in inflation-adjusted 2012 dollars. This article was originally published May 16, 2014. You can support net neutrality by participating in the Internet Slowdown Day.